Antarctica becomes foremost as a travel destination for those adventure seeker who wants to experience a once in a lifetime opportunity. Visiting Antarctica will be a dream that you can share with anyone. Despite its thick ice, this place is filled with wildlife, enthralling adventure and a lot of fun activities you can enjoy here. Visit Antarctica anyway you like, from icebreakers, luxury vessels, and expedition ships, name it, this place has it all. Have a chance to encounter whales and seals and be captivated by the beauty of calving glaciers. Most expeditions to Antarctica offers zodiac tours of icebergs and bays. You won’t afford to get off the ship to view things in an intimate manner. This is a rare experience that you won’t forget. Kayaking in Antartica is a magnificent experience. Floating quietly past with leopard seals and paddling with jumping penguins is something that you want to do again and again. Your adventure will not be completed if you won’t experience this one. But why kayaking in Antarctica? First, this is a nice way to be close to nature. You can reach down to touch water and pick small pieces of ice. It is bragging rights when you experienced kayaking in Antartica. A cool thing that you can put on your travel resume. Beautiful waters of Antarctica are not just for wildlife only. You can also jump in here! But it will take foolhardy to have a willingness jumping into the frigid waters. Polar Plunge is not the fainted heart. This is a popular sport to expeditioners. After taking the leap a reward will be a hot sauna and “I Survived the Polar Plunge” t-shirt. Antarctica highlight is visiting penguins and interact with them. Cutest animals in the world that can bring joy to anyone hearts. This little creature may stalk you mercilessly, grab your pack, and boldly introduce themselves to the timidest tourist. But these will be a memorable experience that you won’t regret. The best place to watch whales will be Antarctica. These creatures are not afraid to human you can see them all around the sea. They don’t run away instead they come closer for a better interaction. It is a magical experience seeing a whale in a wild where you can almost reach and touch them. A gigantic animal will surely feel you amaze and think life under the sea. All Saints Day, also known as All Hallows’ Day, or Hallowmas, is a Christian celebration in honor of all the saints from Christian history. In Western Christianity, it is observed on November 1st by the Roman Catholic Church, the Methodist Church, the Lutheran Church, and other Protestant denominations. The Eastern Orthodox Church and associated Eastern Catholic churches observe All Saints Day on the first Sunday following Pentecost. The Christian festival of All Saints Day comes from a conviction that there is a spiritual connection between those in Heaven and on Earth. In Catholic tradition, the holiday honors all those who have passed on to the Kingdom of Heaven. It is a national holiday in numerous historically Catholic countries. In Methodist tradition, All Saints Day relates to giving God earnest gratitude for the lives and deaths of his saints, remembering those who were well-known and not. Additionally, individuals throughout Christian history are celebrated, such as Peter the Apostle and Charles Wesley, as well as people who have personally guided one to faith in Jesus, such as one’s relative or friend. Sainthood isn’t given by a group of religious leaders. It’s granted by God Himself to any common, salt-of-the-earth person who simply trusts Christ (1Corinthians 1:2). Words matter. And sowing confusion about good, biblical words like “saint” is not from God. The gospel message is that God the Son came to earth, lived a perfectly obedient life, died on the cross to pay for our sins (Romans 5:1), and rose again proving His atoning work was complete (Romans 4:22-25). Saints are those who give up the anti-faith alternative of trying to please God by their good deeds and, instead, trust Christ alone. Scripture says that the person of faith actually becomes the very righteousness of God (2 Cor. 5:21)! Through the channel of human faith (the means of salvation) we become united to Christ (the source of salvation) and we are saved from God’s judgment as well as from the futile way of life that we naturally follow (1Peter 3:18). In other words, we are granted sainthood! Skeptical? Think about this: if God calls the worldly, sinning believers in Corinth “saints”—and He does in 1Corinthians 1:2—couldn’t He call you a saint as well? Friend, anyone who trusts in Christ alone for salvation is a saint in God’s sight. 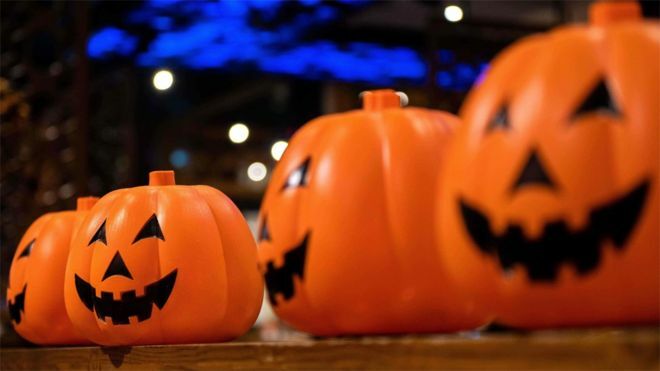 Dressed as Dracula or as devils, neighborhood children were happily “trick or treating” last night in the United States and some other countries. But would it surprise you to know that “Halloween” (by that name) started out as a holy Christian celebration? Hallow, in Old English, means “holy” or “sacred.” Therefore, “Hallows’ Eve,” or “Halloween” simply means “the evening of holy persons” and refers to the evening before All Saints Day, which is this day, November 1 on both Anglican and Catholic calendars. Halloween is a mixture of Celtic religious ideas and Christian martyrology. Pictured below is a traditional Hallows’ Eve Ceremony. But think of it positively. Who are your favorite heroes in Christian History? Can you think of any whose example has inspired you? Why not use All Saints Day to think of and give thanks for as many Christians from the past as you can remember, whether they are famous or not, especially if their lives and teaching contributed something to yours. So, how should we think of All Saints Day? Well, the 1662 Book of Common Prayer says that the holiday stands for “the unity of Christians of all ages, countries, and races in Christ, and the perfection of that unity in heaven.” It dates the holiday back to about A.D. 610 when the Pantheon in Rome, turned into a Christian Church, was dedicated to all saints. Sounds like the prayer book has the right idea. What to do with a house I inherited in Texas? A movie fanatic since birth, Martha gets real about today's movies! Examining writing, one story at a time.